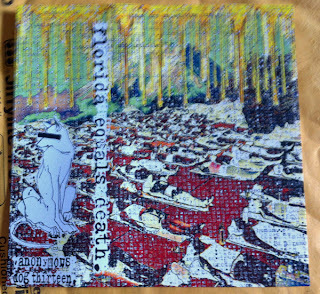 But what you get when you listen to Florida Equals Death, on this tape, is not a specific genre or sound. You get a mixture of many different things and they can either all come out at once or in pieces. 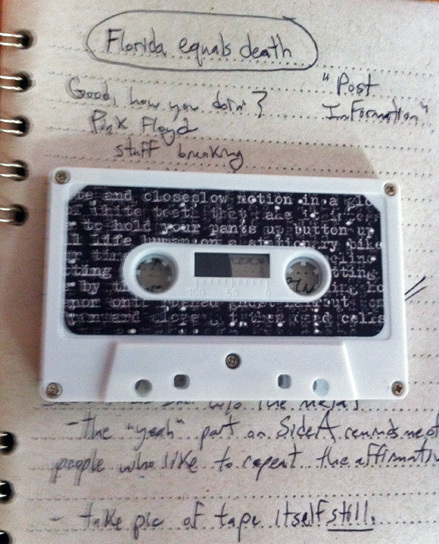 Some of the most dominant sounds on this tape are a cross between psychedelic rock (Because I kept referencing Pink Floyd and Flaming Lips) and what I like to call artcore, though I’m not sure a genre exists (It’s what Fear Before the March of Flames sounds like) If this was a little bit more on the metal side, it could even start to resemble Backstabbers, Inc.
As we close out Side A, there is a person speaking while another person keeps responding “Yeah” over and over. Does anyone aside from me know someone who likes to respond repeatedly in the affirmative? Doesn’t it drive you crazy? I used to be much more sociable (No, really) so if I met someone like that today I might have to point out that little nuance. I also like how Side B begins with a song about there being no “I” in team. As anyone will tell you, there may not be an “I” in team, but that letter does appear in many other important words like, well, important for example. Aside from previous mentioned artists, I can also hear a bit of that crazy poet coming out in these songs, something along the lines of Jim Carroll or Lou Reed. If you can picture all of the people I listed getting together to make music, it would probably not sound anything like you imagine it but it could possibly come out sounding exactly like this.